I'm trying something a little different today, this isn't something I have done before but would be keen to do more in the future should the opportunity arise. One of the few good things that has come out of my commute into London each day is meeting a lovely lady named Kate. Like many of us she holds down a 9-5 full time job, but in her spare time becomes a whole different person. Unlike many of us who tend to spend our time crafting Kate spends hers writing. Recently I spoke with her and here is what she said. So Kate, when did you first begin writing stories? I clearly remember sitting at my desk in school when I was about 8, and giggling because I was writing a story about tap dancing mice. I was told off (things haven’t changed much!). Can you tell us about your journey starting out as an indie writer? I won an Arts Council award about 3 years ago to help me develop my writing skills but actually found it quite a demoralising experience because everyone I met in the publishing industry told me that it didn’t matter how good a writer you were, the chances of becoming published were negligible. I resigned myself to writing as a hobby, but in January 2011 I got together with some friends and started a local writing group so we could help support and encourage each other in our work. In March we asked a wonderful young indie author, Penelope Fletcher, to come along to talk to us about self publishing and how the publishing world was changing. I had honestly never heard the phrase indie writers before then (I’d only just heard of a Kindle!). What she had to say just really blew me away, it was as if a switch had been turned on - I remember listening to her talk and thinking ‘I can do that’. So I did! I just had to give it a go. In less than 9 months I’ve self published 2 e-books, I’m on Amazon, I write a blog, I’ve created a website, set up a Burly & Grum Facebook page, I’m about to go into hard-print - it has been a wonderful adventure, I’ve learnt a great deal and met many incredible people along the same path. Where do you get your inspiration from for both your stories and the characters? I get my inspiration from whatever I see, whoever I meet and from wherever my mind takes me. I have a notebook and I constantly scribble things down in it. If you were to see me on the train commuting into London you’d think, “Ah ha! Now that’s an ordinary, middle aged lady having a doze!” but in actual fact, although I am an ordinary, middle aged lady, you’d be amazed if you knew what I was day dreaming about! What made you chose to write children’s books? My son Angus is now 21, but when he was growing up I used to write stories for him, usually around the time of his birthday. I’d write all his friends into the storyline and then read it out loud to them at his party – they’d have all kinds of adventures and, I’d like to think, really enjoyed themselves! 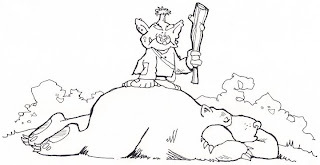 I do write other stories, mostly heroic fantasy adventures with a lot of battle scenes (for some reason I’m quite good at writing a battle scene…) but when I started out along the route of becoming an indie writer I chose children’s books because I already had one that just needed a little adjustment and I was impatient to get going! Can you tell us a little bit about the books? I’ve written two books, ‘Beyond the Forest’ and ‘Burly and Grum and the Secret City’. 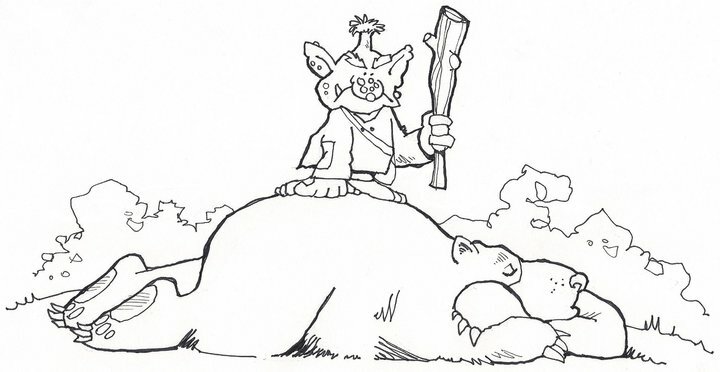 Both books revolve around two central characters - a bear called Burlington (Burly to his friends) and his friend Grum the groblin. Grum is very unconventional - he’s loud, has no manners, is skin is a pea green colour, he likes eating crispy fried earwigs and other things we would consider revolting. Burly is a mellow kind of bear and took Grum under his paw when he needed help. They have all kinds of adventures - theirs is a friendship of discovery, tolerance and the unexpected! Where can we get copies of the book? What’s next for Burly and Grum? More of the unexpected - a crab with attitude, Burly wearing shades and looking cool, stolen gold, lots of baddies and, of course, a beach party! What’s next for Kate? Do you have any other books planned for the future? At the moment I’m finishing up book 3 in the Burly and Grum series and then I’m going to work on some other books I’ve got on the back burner. What advice could you give to someone looking to publish their own writing? Without any hesitation at all I’d say go ahead and do it - if nothing else, you’ll learn about all the work that goes into producing a book. Yes, it’s time consuming and hard work, but at least you get to see your books up for sale on Amazon, you’ll meet other authors and wonderful people and it’s just such an interesting journey. If you’d like any help or advice, I’m more than happy to speak to you. You can contact me via my website www.burlyandgrum.com or you can leave a message for me on my blog, www.burlyandgrum.blogspot.com. However you get in touch I’ll be happy to hear from you. Please please please support this inspirational and lovely lady. you can follow her blog through the above link and please like her Facebook page here. Thanks ladies, and thank you Kate for taking the time to complete this interview with me.